They are rational, logical, methodical and critical, Virgos are down-to-earth and concrete. They enjoy good work. They always strive for the essential, the practical, the useful. They can't really stand criticism but they aren't scared to criticize others. They tend to have a lot of principles. They are smart, consistent, self-confident. Keywords: Methodical, intelligent, careful, meticulous, perfectionist, critical, analysis, order. Virgo corresponds with Intestins and digestive system. Color: Yellow and light brown. Polarity: Feminine, element: Earth, modality: Mutable. 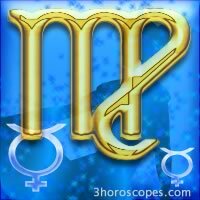 How many planets do i have in Virgo ?